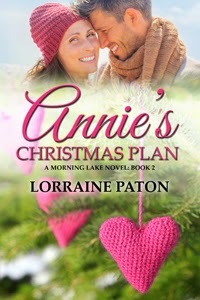 To kick it off, I thought I'd start with A is for Annie's Christmas Plan, which is the latest book in my Morning Lake series. Annie and Quinn's story was just released at the end of November! Given Quinn's cautious approach, she'd expected him to toss the roast to her and bolt back down the drive. Instead, he stepped out of his truck. When she got close, he passed her a plastic bag. He nodded toward the other cars. "It looks like you've got a houseful." "Yep. Everyone's together for the holiday." She peered into the package. She'd never seen a roast so large in her life. It was wrapped in brown paper and stamped in black ink: Uninspected. She'd have to hide that label from Jenna and Kelly. The last thing they needed was a hunger strike based on unfounded fears of BSE. At least, she hoped it was unfounded. Of course it was. Quinn was still alive. He seemed fine. It was probably better not to think on it. "All right then, I'll be—"
"You're welcome to come in for a drink and meet everyone," she interrupted. He glanced at the house and then back at Annie. "Not tonight." "I'd like you to come to dinner tomorrow, if you want. We'll sit down at two or so." He shrugged, which seemed to be his favorite answer to that invitation. "Thank you, again, for everything." She stepped forward. "I'm sorry about earlier." "We've already settled that." It took a moment for her to realize he was talking about the check. "No, I mean about me, my panic attack or whatever you want to call it." He leaned against his truck. "Nothing to apologize for." "It's the first time you're having people in. I suppose it happens." Annie leaned forward to kiss him on the cheek. He pulled back, moving out of reach. "Oh, I ..." Her cheeks were burning. What was she doing? A kiss on the cheek, that's all she had been thinking, as a thank you. She'd do the same with her uncle—but Quinn wasn't Milt. Then he touched her cheek. His eyes were so intense ... so beautiful ... They whispered of some great question. A question she should know how to answer. He bent forward, and her words were forgotten. He lowered his lips to hers. Annie leaned into him, fingers tangled in the handles of the plastic bag. She kissed him back. He smelled of sawdust and some kind of enticing musky aftershave. His lips were strong, but they moved with exquisite gentleness. He teased her, and she opened herself to him. His tongue darted in and out of her mouth, and she sank closer to him with a soft muffled groan. "Mom, are you still out there?" Annie jumped. Kelly had caught her smooching with Quinn in the driveway. In a blink, he was in his truck and she was racing to the house. Her heart slammed against her chest. She tried to dry her lips discreetly. "What is it?" "Come quick, Mom, something's happened." To find out why they are having roast instead of turkey, check out the excerpt here. What did you eat for Thanksgiving? What is your favorite Thanksgiving meal? A very entertaining story. I really enjoyed it. Put me further into the Christmas spirit. Thanks. Thank you for stopping by, Mary! It was a fun book to write!